A research team from The University of Texas at Dallas has been involved in analyzing a variety of materials for several years hoping to find one with electrical properties that may be suitable for small, energy-efficient transistors to power future electronic devices. They recently discovered one such material; however it was something no one expected. Dr. Moon Kim and his colleagues explain in a research article published online in the journal Advanced Materials on March 10, that when a material is heated to approximately 450 °C, it transforms from an atomically thin, 2D sheet into an array of 1D nanowires, each measuring only a few atoms in width. An image captured in mid-transformation appears like a miniature United States flag, and with false colors added, is possibly the smallest image of Old Glory in the world, Kim said. “The phase transition we observed, this new structure, was not predicted by theory,” said Kim, the Louis Beecherl Jr. Distinguished Professor of materials science and engineering at UT Dallas. Since the nanowires are semiconductors, they could be employed as switching devices, just like silicon is used in current transistors to switch electric current on and off in electronic devices. These nanowires are about 10 times smaller than the smallest silicon wires, and, if used in future technology, would result in powerful energy-efficient devices. 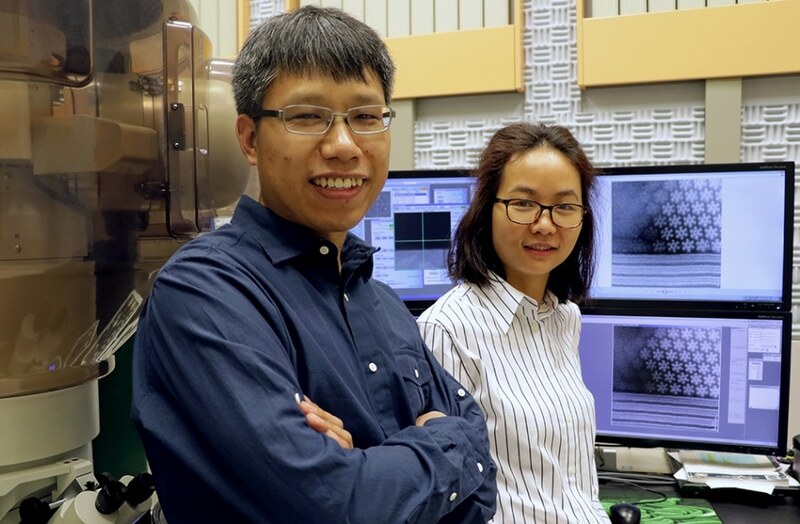 The study’s lead authors of are Hui Zhu and Qingxiao Wang, graduate students in materials science and engineering in the Erik Jonsson School of Engineering and Computer Science. When some materials are exposed to alterations in external conditions, such as pressure or temperature, they can experience a phase transition. A common example is when liquid water is heated to form a gas (steam) or cooled to form a solid (ice). For a lot of materials, however, a phase transition refers to something slightly different. As external pressure and temperature vary, the atoms in these materials rearrange and redistribute to create a material with a different composition and structure. These variations can influence the properties of the new material, such as how electrons travel through it. For researchers keen on new applications for materials, gaining knowledge about such transitions is vital. In most cases, a type of graphic known as a phase diagram assists researchers in calculating structural and property alterations in a material when it experiences a phase transition. However, no one could predict what Kim’s team had observed when they conducted experiments on a material known as molybdenum ditelluride. The research team with a transmission electron microscope began with atomically thin, 2D sheets of molybdenum ditelluride, a material comprising of one layer of molybdenum atoms and two layers of tellurium atoms. The material is a part of a class called transition metal dichalcogenides (TMDs), which exhibit potential in replacing silicon in transistors. We wanted to understand the thermal stability of this particular material. We thought it was a good candidate for next-generation nanoelectronics. Out of curiosity, we set out to see whether it would be stable above room temperature. When they raised the temperature to over 450 °C, two things occurred. “First, we saw a new pattern begin to emerge that was aesthetically pleasing to the eye,” Kim said. Across the sample’s surface, the repeating rows, or stripes, of molybdenum ditelluride layers started to change into shapes that resembled flowers with six petals or miniature six-pointed stars. The material was changing into hexa-molybdenum hexa-telluride, a 1D wire-like structure. The new material’s cross section revealed a structure comprising of six central atoms of molybdenum surrounded by six atoms of tellurium. Each nanowire is a semiconductor, which signifies that electric current traveling through the wire can be turned on and off, Kim said. When several of the individual nanowires are bunched together in bulk they act a lot like a metal, which easily conducts current. We would want to use the nanowires one at a time because we are pushing the size of a transistor as small as possible. Currently, the smallest transistor size is about 10 times larger than our nanowire. Each of ours is smaller than 1 nanometer in diameter, which is essentially an atomic-scale wire. Before we can put this discovery to use and make an actual device, we have many more studies to do, including determining how to separate out the individual nanowires, and overcoming technical challenges to manufacturing and mass production. But this is a start. Other authors of the study are: graduate student Chenxi Zhang, research scientist Rafik Addou, Dr. Kyeongjae “K.J.” Cho, professor of materials science and engineering, and Dr. Robert Wallace, professor of materials science and engineering and holder of the Erik Jonsson Distinguished Chair. The research received funding in part from the SouthWest Academy of Nanoelectronics, which is supported by the Semiconductor Research Corporation (SRC) and the National Institute of Standards and Technology; and the Center for Low Energy Systems Technology, one of the six STARnet centers that are sponsored by the Defense Advanced Research Projects Agency and the SRC.